Our 23rd heart screening day was a great one - everyone who booked in attended. An excellent turnout! 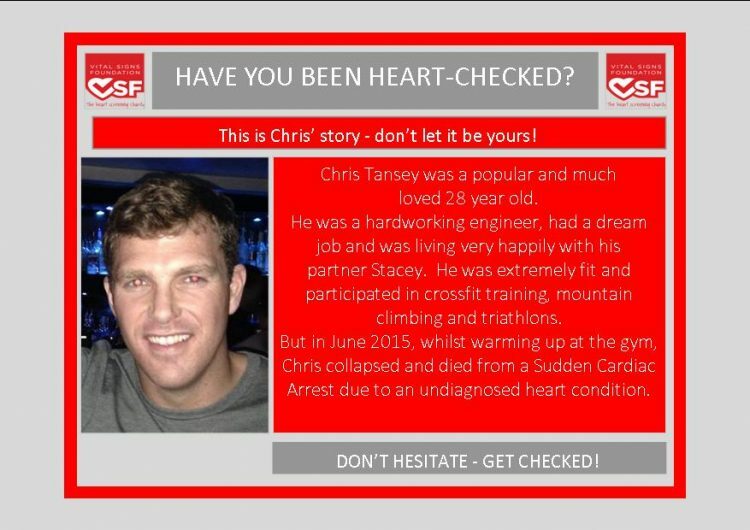 We held our annual Chris Tansey Memorial Screening on Saturday 9th June 2018 – it is three years since Mark Tansey and the rest of Chris’ family and friends lost him to Sudden Cardiac Arrest. We screened 53 people and I’m happy to say that all of them went away happy with their results. Thank you to everyone who generously made a donation on the day – £48.40 was raised. Other people were also asking if they could donate on our Justgiving page as well so many thanks to them! Thank you also to everyone who has shared our charity on social media – it really does help to raise awareness. A huge thank you to Paymentshield for allowing us to hold our screening at their offices, it really is a great venue. Also, thanks to the members of the charity team for their support and assistance on the day! Of course, we have to say a big thank you to our team – Johan, Kerry and Marie from Liverpool Heart and Chest Hospital. They are part of our clinical team and they do a great job. Our paramedics – Lol, Trish, Liam and James – they take everyone’s blood pressure and deliver vital CPR and Defib training. A huge thank you to them! If you are interested in being heart screened for FREE, and are aged between 16 and 35, then please check out our website where you will find out more details about what we do, why and how you can be screened.